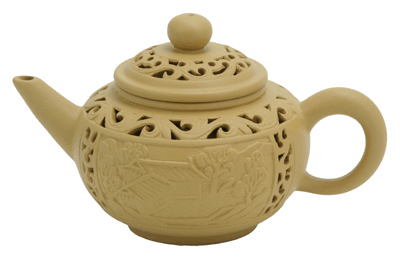 This teapot made from sturdy iron has a matte finish enamel coating on the interior to prevent rusting. The body is cast with a dragon design. Dragon symbolizes power, leadership, and good fortune in traditional Asian culture. Cast ironware heats evenly and retains heat well and is praised worldwide for their beauty, strength, and superb quality. 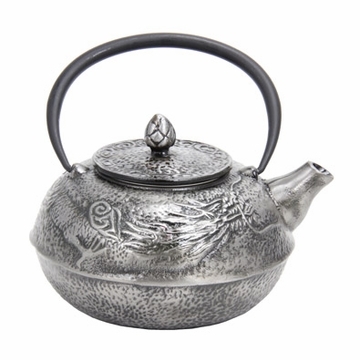 In addition to brewing tea, you can also use this teapot directly on stovetop to heat water. Looks amazing! If your a man looking for a teapot this is the one for you. I give it a 10/10 no problem. The description says you can boil it on the stove but...I can't bring myself to do it... It also has rust on the bottom and the ring where the infuser goes and I've only used it a few times so far. Now that I've gotten the bad stuff out of the way, it makes a lot of cups. If you like taking your time with your tea you'll need the tea warmer and tea light to keep it hot. It also looks a lot more beautiful in person than in the picture. I just got my Silver Dragon teapot and trivet today and I love it! I also ordered a tea sampler and the tea that I tried is delicious. 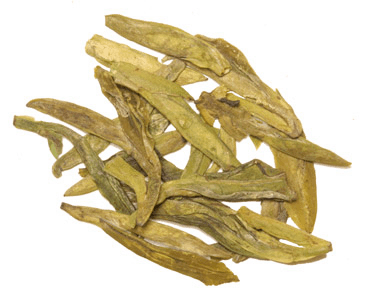 I look forward to buying different kinds of tea from here in the future. great quality and craftsmanship , buy the whole set with confidence ! I just rec'd my teapot this morning. And its Fabulous!!!! tea stays warm for good hour or so. So, i just ordered the tea warmer for it. This is my First Cast Iron Teapot... Glad i found it! Good bye Mrs. Teapot!!! at least i can clean this little guy and see whats inside it. I purchased this teapot after my significant other broke his glass one while washing it. We wanted something much more durable while still masculine. While heavy, it keeps his tea hot for a long time so he can leave it at his desk while he works. He took it too work just this week and all of his coworkers ooo'ed and ah'ed over it. Quality teapot at a great price. Visually appealing and keeps the tea warm a while. Very happy with this purchase! 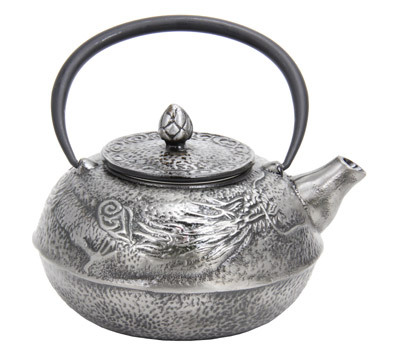 its a good looking cast iron teapot, specially the color silver and the dragon on its body, i got lots of compliments and they always asking where did i buy it..the size is perfect for us, we love tea very much thats why we get this large teapot.. highly recommended..the hot tea last longer.. I am very happy with it, went back and ordered the cups and the trivet to match. I have had this tea pot for a week and use it daily. I replaced a glass tea pot that lost its handle. So far it makes great tea and seems sturdy. The iron will get hot. I am glad I bought the matching trivet! I gave this teapot to my Mother In Law as a gift she loves it. It is so beautiful you hate to use it. But do.